two monsters mixed a stew to eat. 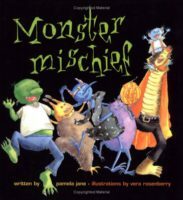 I’m pleased to announce that MONSTER MISCHIEF is back in print, by demand. Print-on-demand, that is! To order call Simon and Schuster at 1-800-223-2348. The ISBN number for this edition is 1481425358 (paper). 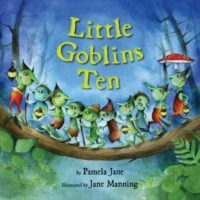 And, of course, LITTLE GOBLINS TEN is still available, and will soon be followed by a Christmas sequel, LITTLE ELFIE ONE (Harper 2015) also illustrated by Jane Manning. So come on and get spooky! 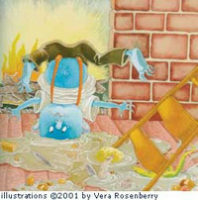 Pamela Jane is the author of over thirty books from board books to memoir. She is also a writing coach, freelance writer, and public speaker. Learn more about her by booking a school visit, perusing her blog, or reading her memoir, An Incredible Talent for Existing: A Writer's Story. pamelajaneATpamelajane.com. All photos and content are owned by www.pamelajane.com and cannot be used without permission.